It is from A+X 6. Gambit and Thing story. That was a fun story. I liked it quite a bit. Wished they had not changed the cover for that issue. Me too. Original cover was very cool. Wow, this is really amazing. Loved it! It's great Purplevit. Great drawing, awesome job. Amazing, is the Diamond shape in the chair with a red background a nod to Sinister or a happy coincidence? Glad that you liked! Of course it is a nod to Sinister Happy that you noticed it! On that page with old Guild symbols that you recommended me, Guilders had drawn red diamonds on their heads. 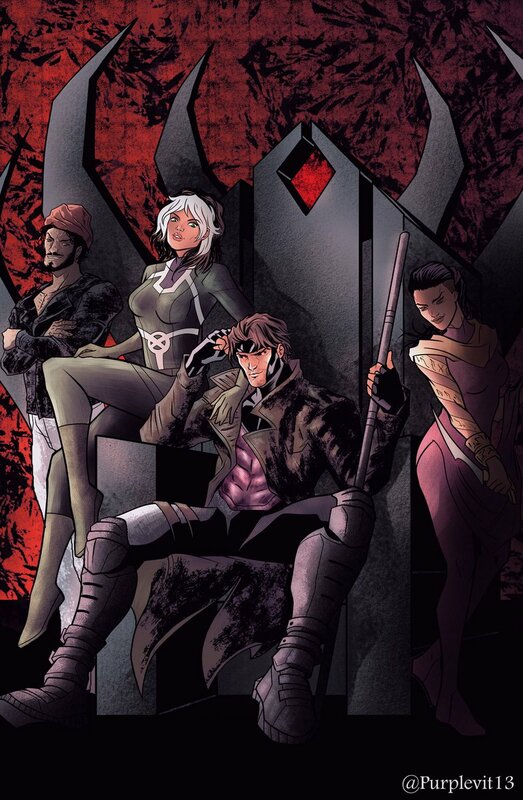 Gambit is in limbo again. Nothing for Gambit in July solcits. Not blind. It's not listed. I did two searches, two different sites for solicits. It's not there. I see Fantastic Four and the Invisible Woman with books. In fact, there is quite a few female lead type books.